Scelus bellicum est "factum contra leges vel mores belli," comprehendens "habitatores territorii capti non militares caesos vel saevitos vel deportatos ad castra servitutis," "captivos caesos vel saevitos," obsides confectos, "excidium urbium, oppidorum, vicorum ultro factae, et vastationem non ab necessitate militari excusatam" (Worth et al. 1999:5). 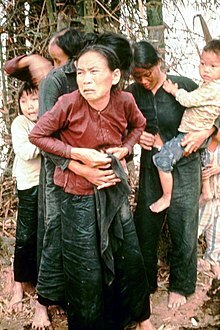 Mulieres et pueri Vietnamienses in vico My Lai ab militibus Americanis fertur necaturi, die 16 Martii 1968. Scelera bellica, secundum humanitarium belli ius, sunt facinora conra humanitatem commissa, quae apud tribunal criminale internationale constituta sunt. Quae scelera sunt: . . .
Adolphus Eichmann, sodalis SS et "architectus Holocausti"
"Russell Vietnam War Crimes Tribunal anni 1967"
↑ SLOBODAN MILOŚEVIĆ sive ab infortunato ad martyrem. Maniscalco, Fabio. 2007. World Heritage and War. Mediterraneum, 6. Neapoli: Massa Publisher. Neier, Aryeh. 1998. War Crimes: Brutality, Genocide, Terror and the Search for Justice. Novi Eboraci: Times Books & Random House. Santillen, Mark. 2007. My Life with Pietro Koch: The history of the beast of Frascati. Romae: Gunther. Werth, Nicolas, Karel Bartošek, Jean-Louis Panné, Jean-Louis Margolin, Andrzej Paczkowski, et Stephane Courtois. 1999. The Black Book of Communism: Crimes, Terror, Repression. Cantabrigiae: Harvard University Press. ISBN 0674076087.